A monster storm that erupted on Saturn in late 2010 – as large as any storm ever observed on the ringed planet — has already impressed researchers with its intensity and long-lived turbulence. A new paper in the journal Icarus reveals another facet of the storm’s explosive power: its ability to churn up water ice from great depths. This finding, derived from near-infrared measurements by NASA’s Cassini spacecraft, is the first detection at Saturn of water ice. The water originates from deep in Saturn’s atmosphere. “The new finding from Cassini shows that Saturn can dredge up material from more than 100 miles [160 kilometers],” said Kevin Baines, a co-author of the paper who works at the University of Wisconsin-Madison and NASA’s Jet Propulsion Laboratory, Pasadena, Calif. “It demonstrates in a very real sense that typically demure-looking Saturn can be just as explosive or even more so than typically stormy Jupiter.” Water ice, which originates from deep in the atmosphere of gas giants, doesn’t appear to be lofted as high at Jupiter. This set of images from NASA’s Cassini mission shows the turbulent power of a monster Saturn storm. The visible-light image in the back, obtained on Feb. 25, 2011, by Cassini’s imaging camera, shows the turbulent clouds churning across the face of Saturn. 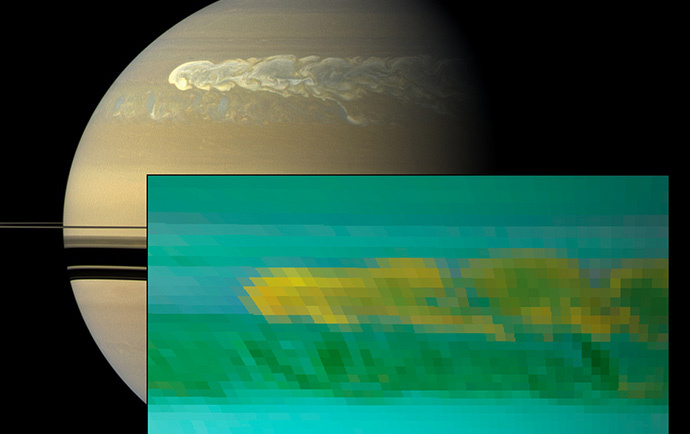 The inset infrared image, obtained a day earlier, by Cassini’s visual and infrared mapping spectrometer, shows the dredging up of water and ammonia ices from deep in Saturn’s atmosphere. This was the first time water ice was detected in Saturn’s atmosphere. The storm, first detected by Cassini’s radio and plasma wave subsystem in December 2011, churned around the planet in a band around 33 degrees north. Image credit: NASA/JPL-Caltech/SSI/University of Arizona/University of Wisconsin. The new paper focuses on data gathered by Cassini’s visual and infrared mapping spectrometer on Feb. 24, 2011. The team, led by Lawrence Sromovsky, also of the University of Wisconsin, found that cloud particles at the top of the great storm are composed of a mix of three substances: water ice, ammonia ice, and an uncertain third constituent that is possibly ammonium hydrosulfide. The observations are consistent with clouds of different chemical compositions existing side-by-side, though it is more likely that the individual cloud particles are composed of two or all three of the materials.